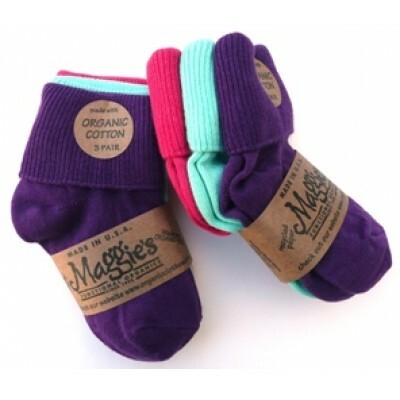 These beautiful colored socks come in a tri pack of colors: Purple, Mint and Pink. They are great worn cuffed or rolled up. Three pairs per package. 77% Certified Organic Cotton, 15% Nylon, 6% Elastic, 2% Lycra. Made in USA at family owned mills in North Carolina. Certified Organic Cotton is Fair Trade CertifiedTM and grown by a group of cooperative farmers in Nicaragua and produced according to NOP standards.